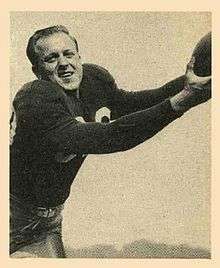 Malcolm James "Mal" Kutner (March 27, 1921 – February 4, 2005) was an American football end in the National Football League (NFL), and was selected as the NFL Most Valuable Player in 1948 while playing with the Chicago Cardinals. He played college football at the University of Texas where he was an AP All-American in 1941. He was an All-Pro End and, in 1947, he was selected as the NFL's Player of the Year. He was inducted into the National Football Foundation's College Hall of Fame in 1974 and into the Texas Sports Hall of Fame in 1990. Malcolm Kutner graduated from Woodrow Wilson High School (Dallas, Texas) in 1938 and, in 1990, was inducted into Woodrow's Hall of Fame. ↑ "UTs All Time All-Americans" (PDF). ↑ Times Staff (February 9, 2005). "Malcolm Kutner, 83; NFL Player of Year in 1947, All-Pro End". L.A. Times.